I have adapted this recipe to make it Gluten/dairy free. The pumpkin makes it incredibly moist unlike some of the really dense gluten free bread I have been making previously. You could probably also use sweet potato, but I like pumpkin as it is now in season. I have used canned but its even more tasty when you cook up the pumpkin yourself and puree it. Let it cool and its ready for the recipe. Preheat oven to 200c. Butter a donut pan and set aside. In a medium bowl, mix flour, baking powder, salt, and spices together, and set aside. In a large bowl, or a the bowl of a kenwood mixer, fitted with the beater, whisk oil, coconut sugar, egg, vanilla, pumpkin, and oat milk until combined. Slowly add the dry ingredients into the mixture- I did it spoon by spoon and stir until just combined, do not over mix batter. Using a pastry bag, fill each donut cup with the batter. Nice circle, not too full as they will rise up a bit. Bake for 11-13 minutes, until donuts spring back when gently pressed. Turn donuts onto a wire each and allow to cool for a few minutes. 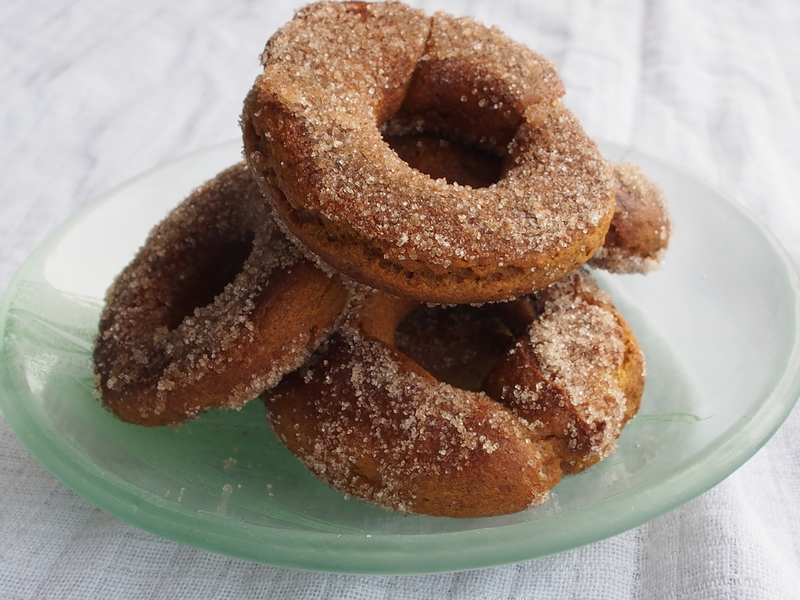 While the donuts are cooling, put the coconut oil in one bowl, and combine the sugar and cinnamon in anther. While donuts are still warm, brush each donut with oil and roll in cinnamon sugar mixture. Serve immediately. I refilled the piping bag and clamped both ends and put in the fridge to make another 6 tomorrow and the next day! !